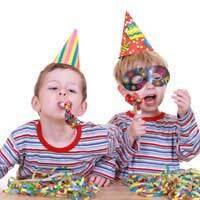 Children love to make things and adults love party preparation help! Enlist your nearest and dearest to help hold a kid’s party to remember! Planning and making items for your kid's party isn't just fun. It can strengthen the bond between parent and child. The bonding can start as soon as you plan the party. If you are planning on sending invitations by post or email then you will have to stick to a set format. If however you are going to hand them out at school then you are only limited by your imagination! Here are some great ideas that will make you the king or queen of the school gates! Raid the pick and mix. Get individual bags, full of sweets and insert a small paper invitation into the mix. Go with a theme: if you are having a fairy party, buy up lots of fairy wings and let all the guests know that they are expected to wear them to your gathering. Give the party king or queen paper and let them design their own card. Give them marker pens, PVC glue, glitter and any other decoration of your choosing. On the back include all the essential details like the name of the child whose party it is, location, date, time to arrive and when the party will finish. Whether you are holding your party at home or at a local hall, you need to add some sparkle to get the children into the party mood. Hang buntings throughout the rooms of the house or hall and don’t forget to take the decorations outside. This lets the neighbourhood and the invited guests know where the party is happening. You can even make these yourselves. All you need is card paper in different colours, markets pens, scissors, staples and a long piece of string. Choose a theme for your bunting. You could stick to the original triangle shape in alternating colours or really go for it with a theme. For example, if your theme is pop stars then you could draw stars or musical notes and cut them out of yellow paper. Simply attach the shapes to the string with staples and hang up! At your party you should try and ensure that everyone goes home a winner. Competitive games are only really fun for the person that gets the prize! Avoid tears and select games that everyone gets a chance to succeed. Think of some group games. Perhaps get the groups going on an on a treasure hunt where the entire team gets the prize. To keep the kids’ occupied at a party you really do need to be creative. Think about setting up stations around the house. You could put Lego or building blocks at one station, face painting at another and a set of paints at one other. This will go a long way to prevent dreaded boredom from setting in. Don’t make me laugh – the object of this game is to keep a straight face while the other players try to make you laugh. The one to laugh is the dropout. The player who keeps a straight face the longest is the winner. Sleeping lions – one player is chosen to be “it”. All other players lie down and become sleeping lions, lying flat on their backs, keeping as still and as quiet as possible. The “it” person has to try and make them laugh without actually touching them. Anyone who giggles is out; the last lion is the winner! Who’s the mummy? – Split the partygoers into teams and give each team a toilet roll. Each team has to choose a mummy. The winning team is the one who can wrap the mummy in the fastest time. They have to be completely covered! The party bag is an important part of the party. It makes everyone feel like they have walked away with a prize. You don’t have to splash out huge amounts of cash to get together some winning party bags. Include items like modelling clay, a packet of garden seeds and a piece of party cake. Kid’s parties are one of the most creative types of party’s out there. You can really let your imagination run wild and fun is the order of the day.